While perusing my blog files I came across this notecard. 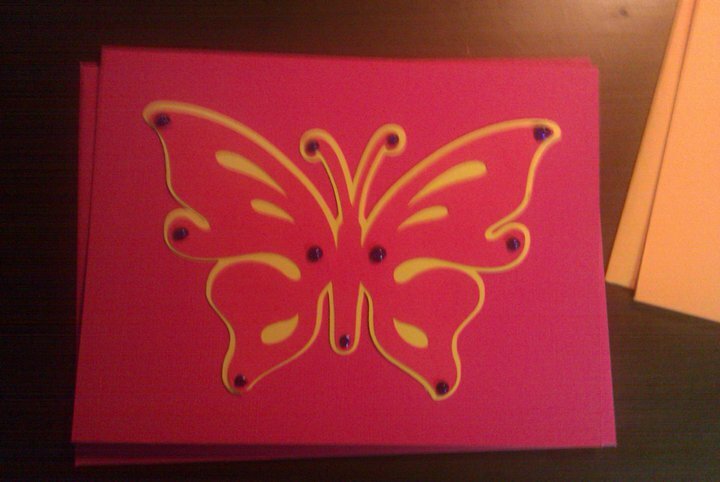 I made 8 of them in 4 different colors. This was my first ever Cricut Project and I was so proud of my layering. Then I added the gems and was pleased as punch at how clever I was. Looks plain I know but I sure like it! 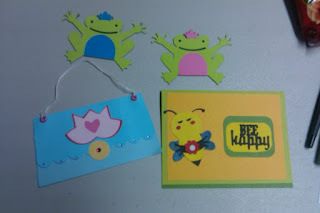 Here was my 2nd project which was the Bee Happy thank you cards. A few of my early blog winners have received that one. The frogs and purse were just playing around. Be sure to come back tomorrow when there will be a Pinterest tried item for the day. I'm not sure what it's gonna be yet so I'll be just as surprised as you are! I think the butterfly card is very pretty. Still stands the test of time. Both are pretty! !Love the Purse!! Wow! I can't believe those are some of your first Cricut projects! They are great! Hi Tangee, What cart. did you use for the butterfly?